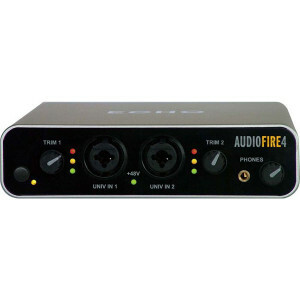 AudioFire4 offers a compact audio interface with all the connections you need for your studio. With the flexibility of FireWire and bus power, you can also take the AudioFire4 on the road. The AudioFire4 can record 24 bit 96kHz audio with low latency monitoring on any Windows XP or Mac OS X computer (desktop or notebook) with a FireWire port. AudioFire4 is the perfect center for any home studio, whether at your desk or on the road. It has 2 universal inputs with mic preamps, phantom power, and trim knobs so you can just plug in your microphone or instrument and record whenever or wherever you want. AudioFire4 also comes with 2 balanced analog inputs (TRS), 4 balanced analog outputs (TRS), a stereo headphone output, 2 FireWire ports, S/PDIF I/O, MIDI I/O, and 6 channels of full duplex 24 bit 96kHz recording and playback.